The school year will be wrapping up shortly, which means if you aren’t already inundated with your little ones artwork and projects, you soon will be. While you may cherish the artwork your little darling produces, the fact is that they produce A LOT of artwork, and if you don’t do something, it will seemingly overrun the house! Some moms display the artwork for a few days or weeks some place such as the refrigerator, and then they toss it and make way for the next group of projects. If you are not sentimental about the artwork, this is an excellent way to keep kids’ projects under control. Keep a small box, maybe about 2 or 3 inches deep and a little larger than 8.5 x 11 inches, and designate it the place where your child can keep all of her artwork from home and school. She is in charge of what she saves. When the box is full, some must go out before new artwork can be saved. Then she will be able to keep her favorites but throw away those that don’t matter to her. You could choose to just save the milestone projects such as birthday cards or Mother’s Day cards your child makes for you. My mom hates clutter, and that is what she did. Each one of her children has about five or six cards, letters and special works that we made for my mom, which she keeps in our baby book. As an adult, I like to look at these cards, but I doubt I would want tub after tub of my artwork to go through. When your child brings home works of art, take a digital photo of the picture. Then, when you have enough photos, get them turned into a custom made photo books. It’s easy to do and you don’t need to enroll in graphic design courses to put one together. Of course, you can do this any time of the year, but you can really save money by waiting until right before Mother’s Day or Christmas when many companies offer deeply discounted or free photo books. 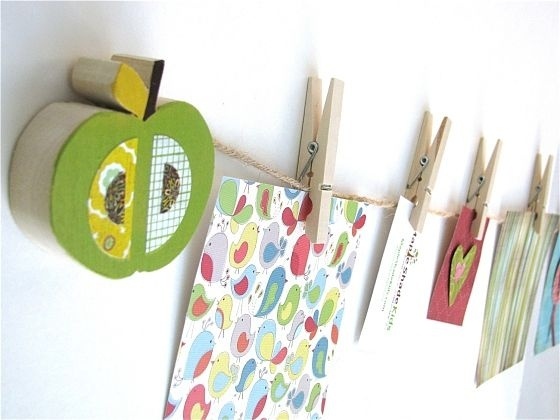 Using this method, your child can look back on their artwork, but very little space is needed. If you just can’t bear to part with any of your child’s work, buy storage tubs and keep them somewhere out of the way like the basement. This obviously takes the most space, but if you are sentimental, it might be the solution for you. Kids are prolific artists, and as parents, we want to cherish all of their works. However, there are simple ways you can still encourage their artistic endeavors and keep the clutter out of the house without spending a lot of money. Pick the method that works best for you to tame the artwork clutter. How do you save your children’s artwork?